All my peoples know that my two musical obsessions are discovering weird cover songs and Japanese Hip-Hop. I have to admit that I’ve fallen out of the Japanese Hip-Hop loop in the last two years (although I’m always down to cop an m-flo or Lisa album). One of the reasons for this was the dissolution of Heartsdales, one of my favorite hip-hop acts ever. Heartsdales was made up of sisters Emi and Yumi Sugiyama (AKA Jewels and Rum) who were raised in New York but launched their careers in Japan. Their code-switching was amazing, they would effortlessly jump back and forth between Japanese and English with thick East-coast accents. For me, their pinnacle was always Fantasy, a cover/homage to Naughty by Nature’s OPP. It’s bilingual booty-clappin’ globalized hybrid of so many influences. Following the break-up of Heartsdales Rum and Jewels went their seperate ways. Rum moved back to New York and is now attending Parsons, studying design. Aside from being a student she has opened an online store of her designs, including a slew of Heartsdales stuff. As soon as I saw the hats I knew I had to have one. I’m so psyched that Rum is pursuing graphic design (a career dear to my heart) and still managing to keep the Heartsdales fire aglow. This hat is rockin’ at the top of my Christmas list (fighting a close battle with an i-phone). 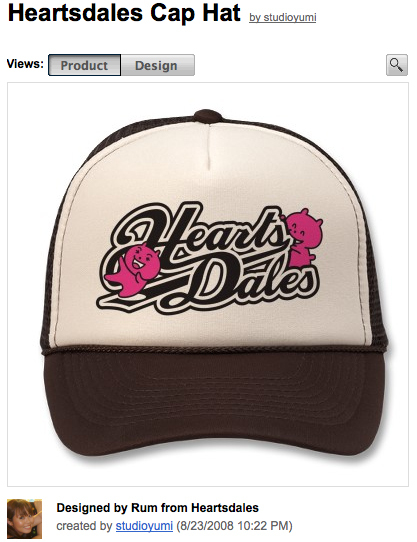 It can be found at http://www.zazzle.com/heartsdales_cap_hat-148029275086574978. If Santa is reading this blog, I swear I’ve been good in 2008. Honest. Previous postDid someone say Frida?